Many horror games rely upon making the player feel powerless in the face of some terrible foe. This is usually achieved by taking away the player's ability to fight back in any meaningful way and instead force them to rely upon stealth and in-game tools/items that will temporarily distract whatever you're trying to avoid. These ideas are at the forefront of The Blackout Club. You're just a young teen and most of the enemies are adults so you're already at a size/strength disadvantage. Layered on top of that, though, is the fact that these adults are people from your town; they could be your parents, or family friends, or a friend's parents, therefore killing them is out of the question. Thus far, it appears that there are two different enemy types: Sleepers and Lucids. The Sleepers cannot see you but have an incredible sense of hearing while the Lucids can see you (and hear you, though their hearing isn't as good) as long as you're standing/crouching in a light source. Sneaking around these enemies requires slightly different strategies, and if you're an area with both then you'll be in a real jam. Fortunately, you can sneak up on an enemy and temporarily knock them out, or you can use an item to either knock them out or distract them. This will buy you some time to get past an area or complete an objective, but the best option is to avoid them at all cost as you never know if there's another foe that's patrolling the area and will stumble upon you in the midst of all that. All of this means you will be spending a lot of time crouching and walking slowly to avoid making a lot of noise as well as trying to stay out of well-lit areas, so if you're not into sneaking games, you may be put off somewhat by The Blackout Club. All of that sneaking around certainly creates tension and anxiety, but it isn't really scary. After all, you can see these enemies and there are ways to deal with them. The scary part comes in with "The Shape," the previously mentioned invisible boogeyman. Unlike the other enemies, you cannot see The Shape normally. While you will get some visual and audio indications that it is near, the only way you can actually see it's location/whereabouts is to close your eyes in the game. This means you are making the choice to not see everything else around you, so you might find yourself bumping into a wall or some other object as you're trying to get away, or even run into one of the Sleepers and Lucids. There's this almost primal fear that kicks in when you know this unfamiliar thing is coming to get you and you have to consciously make the choice between being able to see it, or see what's around you. It is very effective in single-player and, best of all, in co-op. As we started our first mission, we were already cracking on Locke for his... unique approach to stealth. Despite these initial setbacks, things seemed fine overall. We made our way to the first objective and managed to successfully bumble our way through it. As we were trying to figure out what to do next, we got a notification that The Shape was nearby and was hunting us one-by-one; that's when any semblance of cooperation went out the window. I distinctly remember running through the labyrinthine, confining, and eerily lit tunnels that have been carved out under the town trying to find a way back up to the streets as Mike, Locke, and Eric were talking about The Shape coming after them. I didn't care about anything other than trying to find a place to hide, like a bathroom or a closet. I thought we were fine once we found an exit that took us into a house. Then I closed my character's eyes in-game and saw The Shape opening the door behind us. The next thing I remember was running right past all of them, up the stairs, into a bathroom, and closing the door and turning off the lights. I didn't care if The Shape got them, I just cared about being safe. Cowardly? Absolutely, but that "fight-or-flight" response kicked in hard and I let it take me out of the danger zone. We were able to recover and eventually complete the mission, but knowing that The Shape was around and constantly hunting us made everything that much more frantic. The last couple minutes where we're running around trying to find the exit felt a lot like the infamous shootout/street scene from Heat and we're all just shouting "WHERE'S THE VAN?!" I do not think I've breathed a greater sigh of relief than when we finally made it to the exit. 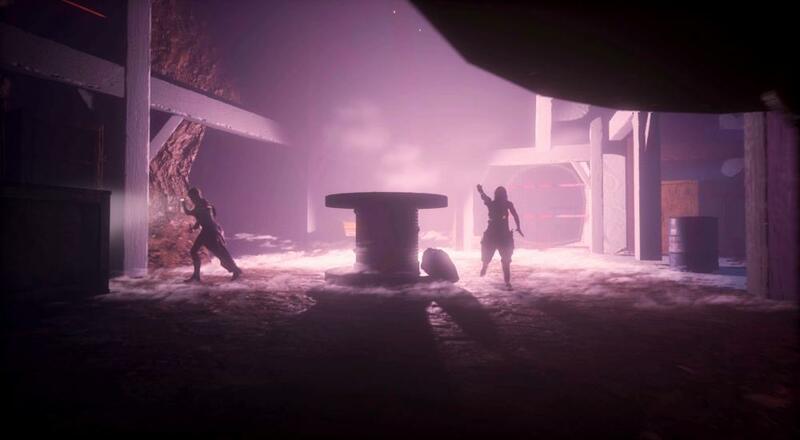 One final thing I wanted to note about The Blackout Club is that it doesn't use "instant fails" when you get caught, either by The Shape or human enemies. As you can see in the recap video, should The Shape get you, teammates can come and "wake you up" so you can keep playing. If a Lucid or Sleeper catches you and you don't have enough Stamina to fight back, you'll be dragged to a mysterious red door. On the way there, you'll pass by trash piles that you can search for something that will help you get away. This kind of safety net really helps make the game feel more fair and allows players to better explore and learn/push the mechanics. The very idea of "co-op horror" is one that often seems counterintuitive. When you're on the mic with a friend or two talking/joking around as you do and playing the game with them, it's harder to experience the same degree of terror that you might otherwise feel if you were playing alone. However, by focusing more on creating a lot of anxiety and tension at any given moment, Question has made something where the scares will happen all on their own regardless if you're going it alone or with friends. It'll be sometime before I forget the feeling of hiding in a bathroom while watching Locke, Mike, and Eric struggling against an enemy they couldn't even see and knowing no matter what, it would be coming for me eventually. Page created in 1.0069 seconds.